Recall the Pakistan cricket team right away, arrest on arrival and try in a court of law like common crooks that they are. cancel the forthcoming one day series forthwith and recall the cricket team back. According to media reports the outcome of that series has been predecided by the betting world. It doesn't really matter whether remaining matches are played honestly or not, whatever the result it will be tainted. Continuation of the current series will create unnecessary media frenzy and delay anti-corruption proceedings against the culprits. Arrest the team on arrival at the airport and let the National Accountability Bureau investigate the corruption charges like they are supposed to do for anyother corrupt public figures in Pakistan. All those proven to be guilty should be banned for playing all forms of cricket in and out of Pakistan. They should also serve jail terms appropriate to their crime. There have been previous attempts at investigating and bringing the culprits to justice. Enquiry lead by Justice Qayyum in its report fell short of implicating the so called heroes of Pakistan cricket and recommended action mostly against those who were in effect out of the lime light. It is time for Pakistan cricket to bite the bullet and make an examples of those who have brought shame to a nation of cricket fanatics. A public service blog post this time. 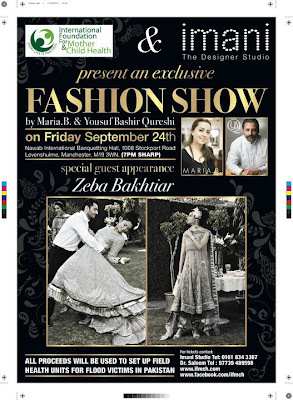 Two internationally recognised Pakistani fashion designers Maria B and Yousuf Bashir Qureshi (YBQ) are coming to Manchester to run a charity Fashion Show in partnership with International Foundation for Mother and Child Health (IFMCH) a local charity based in Cheshire. All proceeds from this charity event will be used to set up field health units in the flood affected areas of Pakistan. The event will take place on Friday 24 September at Nawab International Restaurant Banqueting Hall, 1008 Stockport Road Levenshulme. Tickets for the event are available here. While the world at large is practically indifferent to the sufferings of victims of one of the biggest natural disasters - floods in Pakistan, there are individuals and small organisations that are doing sterling work on the ground with or without the support of government infrastructure. One such organisation is JAWAN - a group of young alumni of various educational institutions who got together to help the victims of SWAT last year and are now actively helping the flood victims. Here is a short report on their work and how you can join in to help. We have Alhamdulillah been able to raise PKR 5.2 million+ (52 lac) in just 10 days. To start with, we had PKR 987,000 set aside from the remaining IDPs fund for rehab in Swat. Unfortunately due to the frail security situation earlier we could not go there. After hearing about the devastation caused by floods we used these Swat-rehab funds as base, immediately started raising more funds and used last years teams and channels (with some new volunteers joining us) and went in to Swat for Round-1 of Relief Efforts. We provided basic food items (10kg flour, 5 kg rice, 2kg lentils, 2kg sugar and 1kg ghee) to 1200 families in remote areas. Most distributed by hand, some sent to Matta area through heli[copters] and some sent deep into Shangla through mules with the help of Pak[istan] Army. All the while fund-raising for Round-2 was aggressively going on and planning for Round-2 Southern Punjab was being done. As soon as we came back, a larger team left for Alipur/Jatoi/Kot Addu areas this last Saturday. They took their time surveying around to make sure they deliver by hand to the most needy. By tomorrow INSHALLAH they would have distributed food items to around 2000 families in distress. Round-3 fund-raising is in full swing. In the past 10 days, excluding the base amount of PKR 987,000 with your selfless efforts and trust, we have been able to raise more than 4.2 million+ (42 lac) rupees which is no small feat. Most of the money is here, payments have been done for the first two rounds and the committed money is being followed up to make sure we have money in hand and a good estimate to procure goods for Round-3. We urge you to keep this momentum and raise as much money as you can, create as much awareness as you can. Remember, we are willing to go for as many rounds as we can and only your contributions and fund-raisers can make it possible. For donation procedures and details, please visit the document-link below. Was David Cameron wrong to accuse Pakistan of double standards on terrorism! Many have have been saying it openly and in private what David Cameron said about Pakistan and its complex engagement with Terrorism. But David Cameron committed the cardinal sin of saying it in the wrong place of all - India. The general public in Pakistan sees India as a far greater threat than either Al Qaeda or the Taliban. A research study conducted in Pakistan and elsewhere by the Pew Poll during April this year contains some powerful lessons for both the US and the UK. It might've been a good idea for the Foreign Office to have read it before David Cameron gave an anti-Pakistan speech in India. A majority of ordinary Pakistanis see India as the most serious threat to their country -more than twice as many as the 23% who think the Taliban a dangerous threat. A derisory 3% think Al Qaeda is something for them to worry about. This latter is of course America's greatest obsession, and US strategists would do well to put themselves in the shoes of regional 'friends' - if they still are that: 59% of Pakistanis describe the U.S. as an enemy, and less than one in five - 18% - say they trust the Americans. President Barack Obama is also very unpopular, with only 8% of Pakistanis expressing confidence that he will do the right thing in world affairs. This is his lowest rating of any major country by a factor of three times....and gives the lie to any idea that his religious background is a plus-point. But perhaps the most worrying results are those concerning anti-terrorism and the war in Afghanistan. Only one in five Pakistanis support a US-led 'war on terror'. And a mere 7% support the war in Afghanistan. The most stark contrast of all, however, is that of the yawning gap between Indian confidence in the US, and Pakistan's mistrust: 83% of Indians think the US has their interests in mind, but only 19% of Pakistanis do. There is an obvious lesson here for the Obama administration: its claims to be pro-Islam aren't credible, and its trust in regional allies like Pakistan is misplaced: most of that country's citizens see the US as a friend of their greatest enemy....and the enemy next door agrees with them.